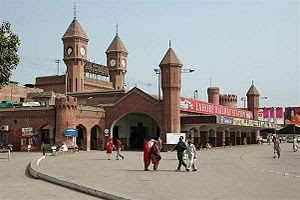 The Lahore Railway Station in Lahore, Punjab, Pakistan was built by British colonists between 1859-1860 at the cost of half a million Rupees. It is of typical grand British architecture in South Asia during the British Raj period. The railway network established by the British was extensive and is one of their lasting contributions to the culture and infrastructure of this region. The railway station has 11 platforms (1 to 9, with 2 extra platforms, 3A and 6A). Platform No. 1 is of special importance, as this platform is the destination of "Samjhauta Express", the train service between Pakistan and India.